33 The followers asked Jesus, “Where can we get enough bread to feed all these people? We are a long way from any town.”34 Jesus asked, “How many loaves of bread do you have?” They answered, “We have seven loaves of bread and a few small fish.” 35 Jesus told the people to sit on the ground. 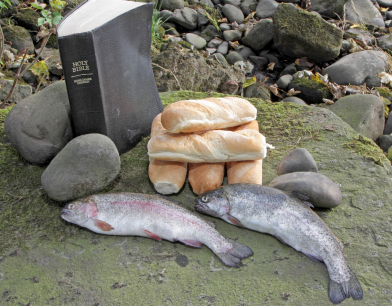 36 He took the seven loaves of bread and the fish. Then he gave thanks to God for the food. He broke the bread into pieces, which he gave to the followers, and they gave the food to the people. 37 All the people ate until they were full. After this, the followers filled seven baskets with the pieces of food that were not eaten. 38 There were about 4000 men there who ate. This is a very familiar story to most of us. In both cases 1. People were in need 2. Their needs were met. My pastor preached from this text “turning little into much” which gave a wonderful illustration to the congregation. Many of us are praying feverishly for God to answer our prayer. It may be that we have a little money but it’s not enough, we have a little faith but it’s not enough, we have a little courage but it’s not enough, we have a little strength but it’s not enough, we have a little food but it’s not enough, we have a little information but it’s not enough to fill the need. Before Jesus did anything he had everyone sit down. We need to have a seat. Rest for a second. Stop standing around looking for provision to drop out of the sky. Have a seat and give thanks. Begin to thank God for what you do have KNOWING He can multiply it. The size of the crowd didn’t concern Jesus, he understood that being thankful has its benefits. The size of our NEED shouldn’t concern us either. It doesn’t matter if the crowd(our needs) are 4 or 5 thousand. Being thankful is the beginning of increase. After Jesus gave thanks he immediately started paying it forward. He gave what he had away, and they gave what they had away until everyone had enough. This method feeds 5000 men with 12 baskets left over. The next time there was a shortage, (Jesus didn’t stand around wringing his hands over what to do) he repeated exactly what he did before. He feeds 4000 with 7 baskets left over. Our God is the same yesterday, today and will be the same if we live to see tomorrow. If you want increase in ANY area of your life. Ask yourself “what do I have?”, sit down, give thanks and start blessing others and watch what you have multiply MIGHTY! We may not have it all but we all have something. What are you doing with the something you have? That’s good ma’am!! I certainly believe that is true. Thank you and keep letting God use you.